Needles are one of the most commonly used medical devices. Needles can access blood vessels and organs, can be used to extract tissue or fluid samples for diagnosis, and can deliver drugs or radioactive seeds for treatment, such as biopsy and brachytherapy. State-of-the-art needles are made of stainless steel with a variety of tip geometries for enhanced insertion efficiency. However, there is limited success in pain reduction and accurate targeting. In seeking a better insertion approach to overcome the aforementioned issues, the idea of a mosquito proboscis-like needle has drawn our attention because a mosquito's insertion is generally painless and has precision guidance into the blood vessel. It is believed that the unique insertion mechanisms used by mosquitos can be applied to create a revolutionized, novel needle insertion tool for medical procedures. Analyses: Modeling techniques for analyzing insertion mechanisms, including motion effects, friction generation, tissue cutting mechanics, tissue fracture, and visco-elastic deformation. The goal of this research is to build a fundamental understanding in how a mosquito proboscis insertion mechanism can be transformed into needle design for efficient tissue penetration. Specifically, we are currently exploring the design and manufacture of the needle components and the special jagged texture on the surface using multi-axis grinding and laser micro-machining techniques. 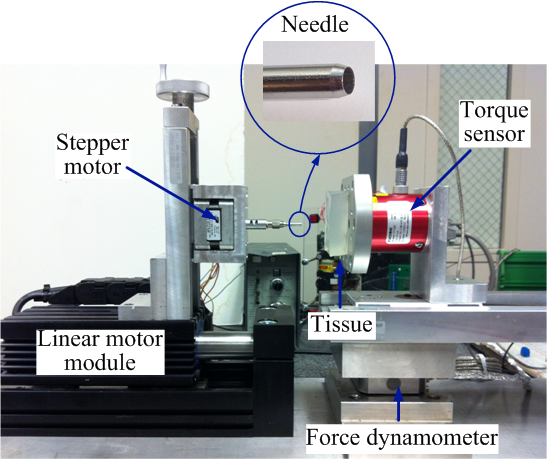 Next steps include the investigation of the interactions of the tissue with needle components (labrum, maxillae) and surface texture, both experimentally and numerically. Finally we will incorporate the motion effects, including frequency, stroke length, and advancing speed to analyze and experimentally verify insertion performance.